making this box Rock Solid for extended life in a very small package! Clair Brothers, Cirque du Soleil, PRG, Solotech, Masque Sound, Lake Shore AV, Thunder Audio, Lion King National tour, Allstate Arena, Auditorium Theater Chicago, Clair Global, Edge Audio, Creative Technology, The Joffrey Ballet, and scores of professional road technicians throughout the country. Works Great for Balanced and Unbalanced Cables. The AudioMan BOX contains two 600 Ohm 1:1 transformers and four capacitors. Similar to the ubiquitous "IL-19"; this box is used as an isolation transformer with significant improvement. Since Line 2 and Line 3 both resolve to Ground The AudioMan BOX also acts as a Line Level Terminator which adds new methods for eliminating hum caused by ground loops. Frequency Response: 20Hz to 25kHz ± 1.5db. This device is a handy isolation interface between two different intercom systems. For Example:A Road Show wants to connect their lighting intercom channel to the house intercom system in order to call cues to the house spotlights. Or,The Video Department is using their own RTS System at the switcher and at cameras, and the main Production System is Clear-Com. With the "AudioMan ISO Box" you can achieve this while leaving both intercom systems intact. No need to disconnect or power down the house intercom base station or fool around with the camera CCU's. Great results have been reported from customers by placing the ISO Box ahead of TELEX Wireless base stations to eliminate noise. 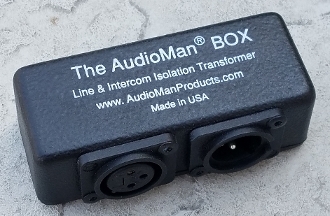 The AudioMan BOX can be added to the end of a string of belt packs and plugged into a powered speaker to monitor intercom conversation withouthaving to wear a headset. Or you can patch into a recording device to keep a log of show conversation. Or you can use it the other way around and patch a line level audio track into the headset string. This device will interface analog XLR 3 pin type intercom systems of any kind (Clear-Com, Telex, RTS, HME, etc.). Use to isolate most Wireless Intercom System (such as TELEX Radio-Com) from the base station.